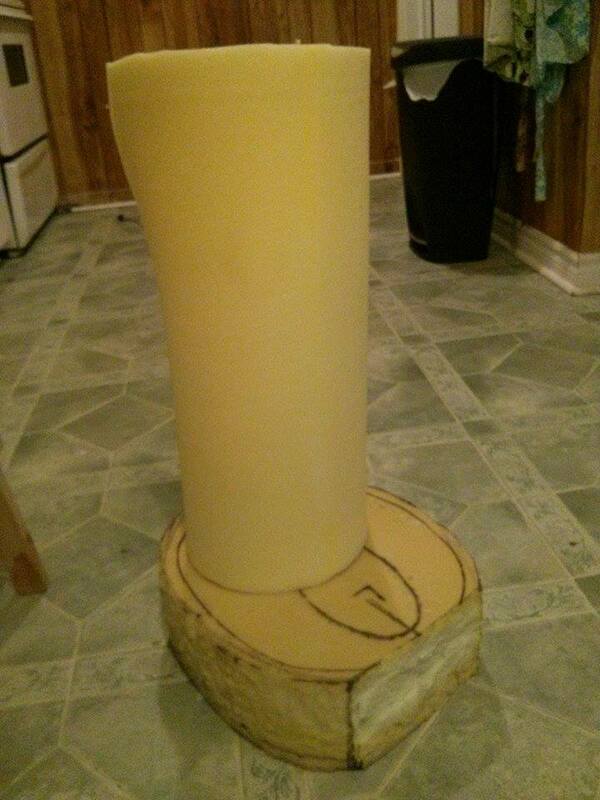 In the last couple of weeks, I've made a lot of progress with Atlatl's legs. When we last left our heroes, I'd built his feet, and I'd made them the biggest I could, figuring I could trim them down later. 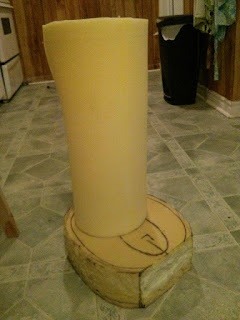 I'd also started to build one of the legs. Well, I tossed out the leg I'd started and made something different. 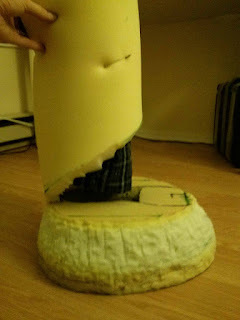 His new lower leg started with a straight cylinder of one-inch foam. As always, I used GIMP a great deal to superimpose images of the foot I wanted over images of the foot I had so I could figure out what I needed to do. Referencing a lot of photos of elephants, as well as a tutorial by Monika Zagrobelna, who has an amazing series of tutorials on drawing various types of animal, I decided that I would indeed make the feet smaller. The foot is going to get narrower as it goes further up. 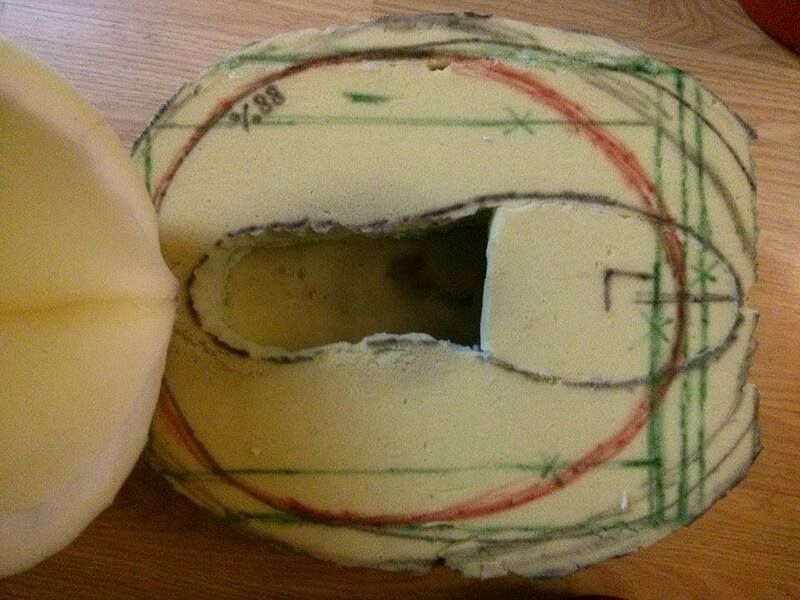 The red oval in the picture below shows where the circumference of the foot will be at the top of the thick piece of foam. It looks like I'm cutting my own toes off, but the edge of Atlatl's foot will actually pass through the piece of foam that sits above my shoe. 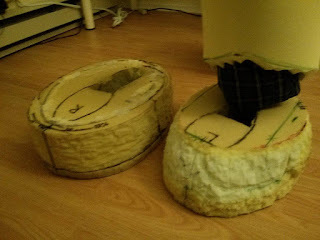 I also bought a pair of pyjama pants that fit over my regular pants; I'll be building Atlatl's legs around them. I safety-pinned the big cylindrical foam leg to one of the pant legs, and that's as far as I've gotten for now. Update, three days later: I've now sculpted the foot further, so it really is narrower at the top. I started by drawing a green line around the side of the foot, to mark the level at which the foot should hit its largest size. 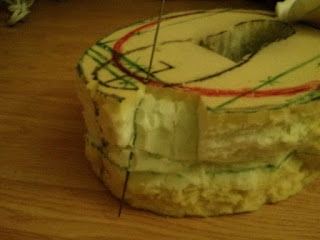 Then, I stuck a metal rod into the foot at a point on the red circle, and out again at that green line, so I knew where the diagonal edge of the foot should be. Then I cut through the foam until I reached the rod. 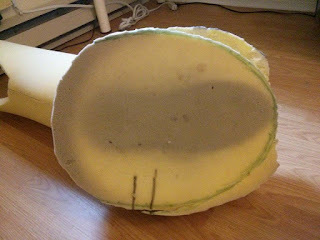 Then I removed the rod and did the same thing at a point slightly further along the red circle, cut down until I reached the rod, and then cut across from the first point to the second point. Then I did it many more times, until I'd gone all the way around the foot. I then used the scissors to neaten up the new edges I'd made. It now looks much more like an elephant foot, and it's easier to walk in it too. You'll notice that I also trimmed the bottom of the leg. Below the cut is where the leg will curve outward to meet the foot.